I like to have a weather forecast right on my desktop instead of having to to look it up on one of these overcrowded and ad-riddled weather pages or (heaven forbid!) having to switch on the TV. 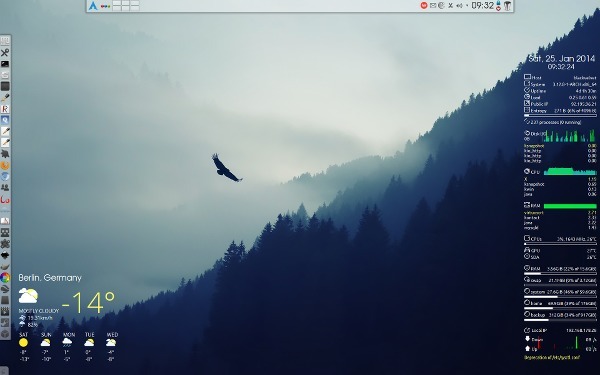 When I switched to conky, I thus integrated a forecast into the main conky display using conkyForecast. A few weeks ago conky stopped forecasting, and I soon discovered that the conkyForecast script had been abandoned long ago. Detailed information of the current weather can be obtained easily with a few lines in your .conkyrc: just query http://weather.noaa.gov/pub/data/observations/metar/stations/EDDT for one of the keywords 'last_update', 'temperature', 'humidity', 'pressure', 'wind_speed', 'wind_dir', 'cloud_cover'. A working .conkyrc implementing this query can be found in the Archlinux forum. Also note the panel with all those application icons waiting to be clickedy-clicked on the left. ¡Viva la Revolución!